It's become something of a tradition to post a little something special for Boxing Day on my blog. Last year it was a paper box pattern, the year before a limited-time free download of my Beaded Acorn earrings tutorial. 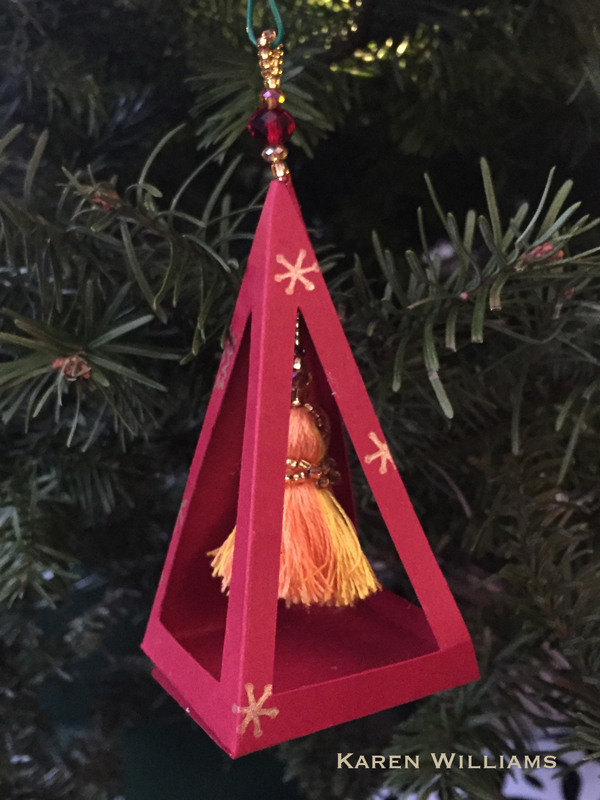 This year, I decided to combine two of my current favorite crafts: paper crafting and beadwork into a little Lantern ornament. Depending upon the colors you use, I've found this pattern works pretty much year round. In this sample, I've optimized for the winter holidays. utility knife, steel ruler & cutting mat OR paper cutting machine. 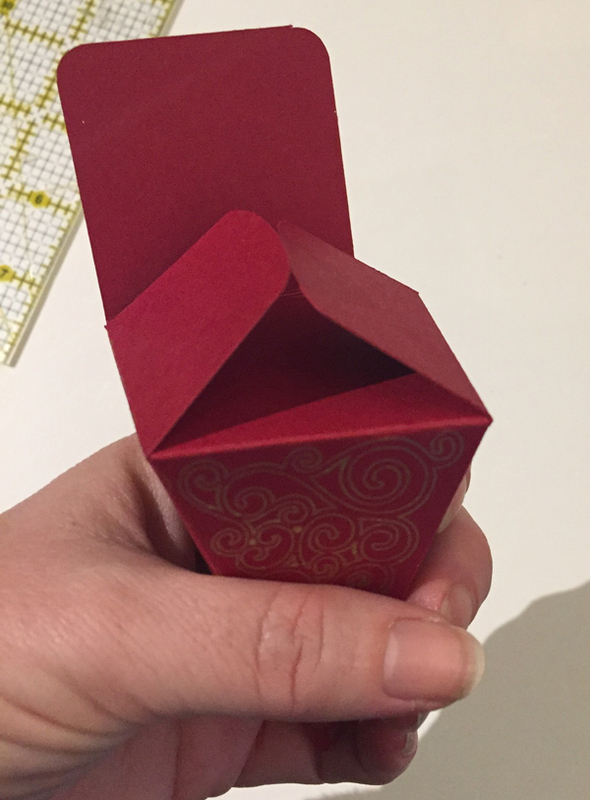 Download and Cut out Design: Save the image of the basic lantern pattern above and print it out so that each box equals one inch (1") square. Refer to the rulers on the left and top edges of the image. Use this as a guide for cutting out your paper pattern with an utility knife and steel edged razor. Or, if you have a paper cutting machine, you can download a copy of my design, which fits two lanterns on a single sheet of cardstock. I designed the pattern in Cricut's DesignSpace. And because I hate wasting paper, I filled the rest of the sheet with some little gift cards and tags. 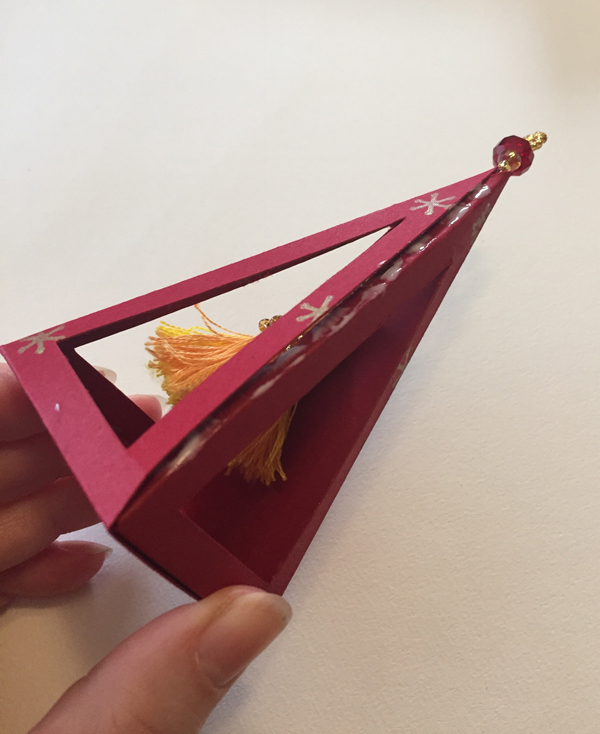 Score and Fold: Once the pattern is cut out, it's time to fold the lantern along the scoring lines. 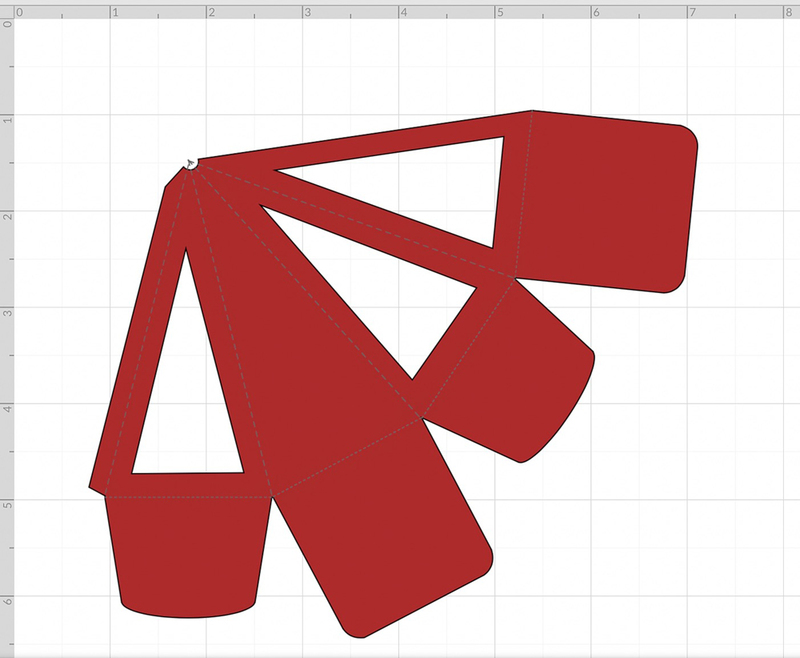 Refer back to the pattern above - the dotted lines indicate folds. 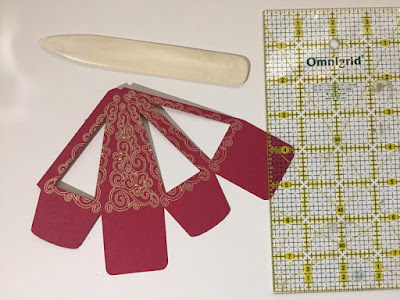 I find it's easiest to do this with a bone folder and a clear, quilting-grid-style ruler. Work from the inside/back of the paper. Score each fold-line first by lining up your ruler, then running the tip of the bone folder down the line along the edge of your ruler. 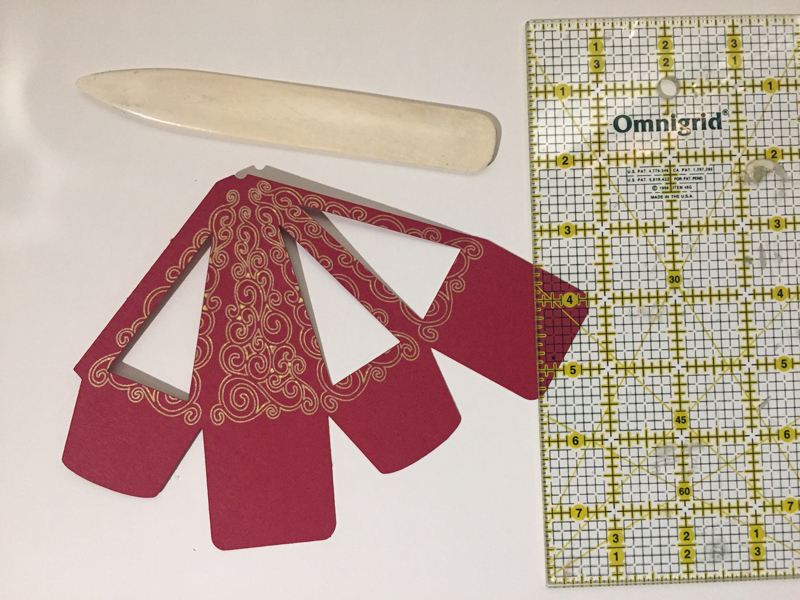 Then, without moving your ruler, slip the bone folder underneath the flap and use it to help fold the paper up along the edge of the ruler. I couldn't get a good picture of this because it required more hands than I had available. Remember to score and fold the little overlap flap at the left edge of the design, too. Use the pattern photo above as reference. Now, it's time to make the tassel. A while back, I wrote a detailed blog post on how I make my little tassels, so I won't repeat the entire process here. This time around, I ended up using a couple of playing cards stacked together for stability, because I liked their size. I wound the embroidery floss around the cards width-wise, using about 1 1/2 half skeins. Once I had the thickness I wanted, I tied off the centers on both sides of the card, and cut the ends from the edges of the card using the utility knife (Exacto blade). 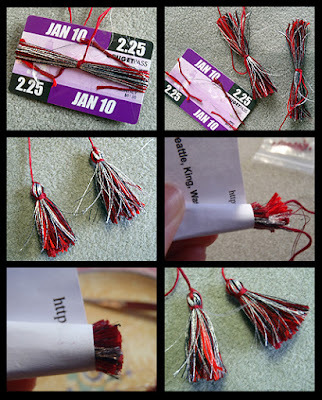 This method makes two tassels. I decorated the tassels with a little beadwork, including some peyote stitch around the neck, and then a beaded 'chain'. 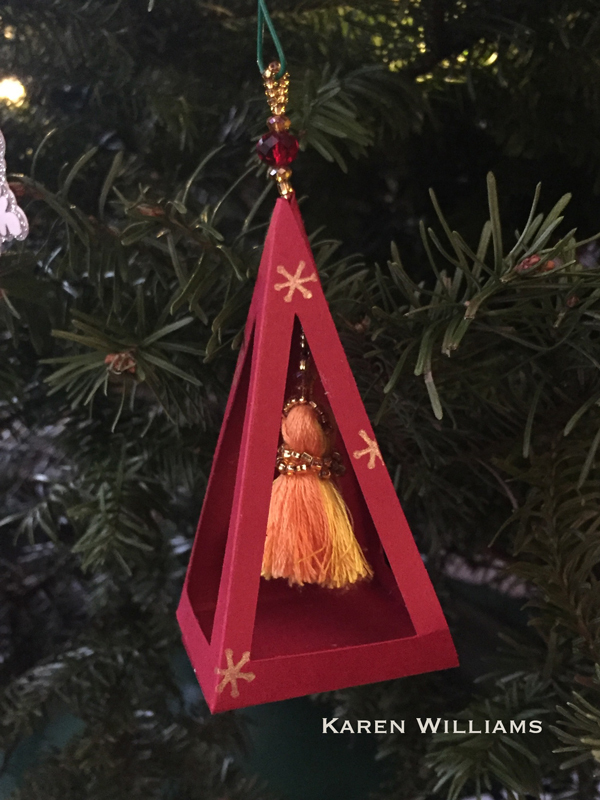 Adjust the length of the chain so the tassel hangs where you want it. Putting it all together: Finish the chain with a larger bead that will hanging inside the lantern, and a larger bead above the lantern, then a little loop of beads. 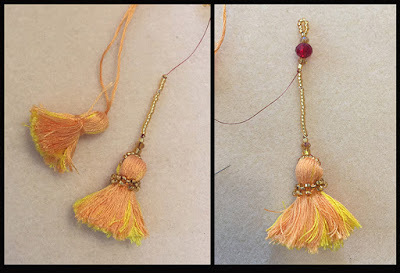 You need a large bead inside, and a large bead outside to act as 'stop' beads so the tassel stays where you want it. Test the fit with the lantern to make sure this works. Adjust your beading if necessary. Now it's time to glue it all together. Gluing the Bottom. Start by folding in the bottom flap of the back (solid) side. Apply glue to the outer (under) side; then fold in the two side panels and make sure they adhere well to the back flap. Apply more glue to the bottom of the side panels. Before you fold in the bottom front panel, make sure that you apply glue to the outer edge of the little side flap. Take a look at the next photo below. Adhere the side flap to the inside of the front panel, and fold the front bottom into place to complete the little lantern. It can take some massaging to get the glue to adhere the little flap firmly to the front panel. Take time to line up the edges for the cleanest finish. Final Notes: I used solid-colored paper for my lanterns, and decorated the outer side with designs 'drawn' with a metallic gold pen. But you can change the look simply by changing the color palette or using patterned papers. 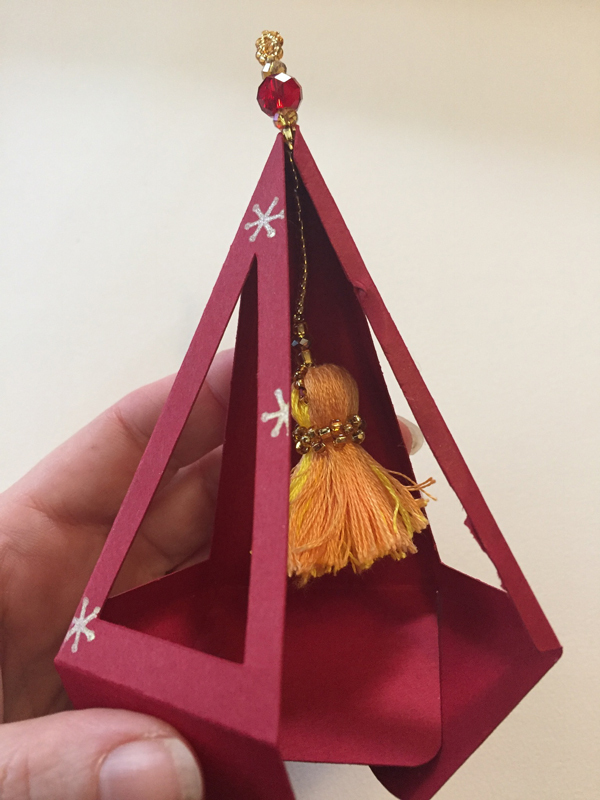 Next I want to make one using dark blue paper and silver ink, then make an 'icy' tassel to go inside the lantern. Then I'd have Fire and Ice! So there's my quick little "Lantern" ornament idea.